Neurotransmitters are molecules that inhibit or stimulate a postsynaptic cell, which is released in the body by the presynaptic nerve cell to produce a response to a certain stimuli. 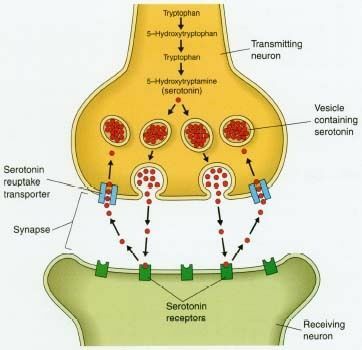 Some examples of neurotransmitter substances are serotonin, glycine, endorphins, gamma amino butyric acid (GABA), acetylcholine, norepinephrine, and dopamine. This substance, which is found in the brainstem, the gastrointestinal tract and the platelets, is responsible for sleep induction and good mood. When the concentrations are elevated, it is often associated with delusions and schizophrenia. Glycine is found in the spinal cord and the brain. This acts in an inhibitory manner in the spinal cord and enters the neuron, resulting to Inhibitory Postsynaptic Potential or IPSP. You can find these neurotransmitters in both the central nervous system and the peripheral nervous system. It is also known as the endogenous morphine because it has almost the same effect as morphine. Morphine acts as an anesthetic agent and induces euphoria and a false sense of well-being. GABA inhibits almost 90 percent of non-glutamate receptors. Most neurons in the central nervous system contain GABA receptors, which makes it the most common. Acetylcholine is one of the more popular neurotransmitters and is found mostly in neuromuscular junctions. The enzyme acetylcholinesterase catalyzes the conversion of acetylcholine to other products, which the body could use again. Norepinephrine is found in the brain and spinal cord and is rapidly metabolized and recycled. This catecholamine has an excitatory or inhibitory effect in the body. This substance has an excitatory effect and is found in the Autonomic Nervous System or ANS. Oversecretion of this substance results to schizophrenia. All of these neurotransmitters have the purpose of transmitting neural reactions from the neurons to the target tissues or cells.